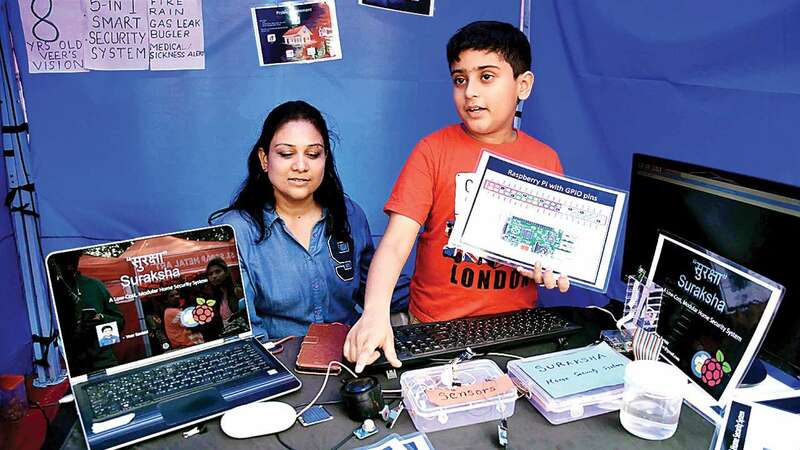 While the city is reeling under fire catastrophes, an 8-year-old has developed a low-cost home security gadget which will help detect fire in the house through an SMS. Not just fire, Veer Bavishi’s innovation will help to detect disaster like gas leakage, water leak, pipe outburst, burglary inside the house. Bavishi showcased his gadget in the Somaiya Vidyavihar’s Maker Mela organised by Research Innovation Incubation Design Laboratory (RIIDL). A Kandivali resident, Veer engineered the gadget taking help from his mother who is a data scientist. “Once there was a fire incident in my building after which we thought of coming up with a gadget which will help us detect such incidents and alert the family members through SMS and the neighbours by ringing an alarm,” he said. Besides Bavishi, other innovators from across the country who showcased their talent included Mukund Shah (83), who creates exciting DIY products; Sohel (17) who developed an ultrasound-based Smart Blind Stick to make life easier for the blind; Prashant Gade, maker of India’s first of its kind myoelectric prosthetic arm specially designed for people with low income source; Hridisha Podder (16) who has developed a waste collection and disposal model to maintain the cleanliness of railway coaches.